Our September Hivery Circle with Radha Agrawal was one for the books! It was a deeply inspiring evening focused on belonging, and our universal need to come together in community. 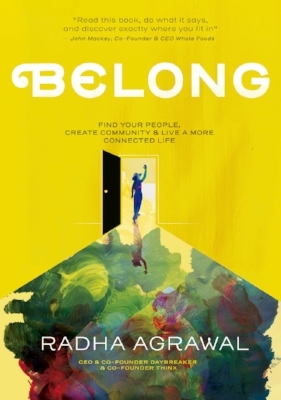 Known to many of us as the co-founder and CEO of Daybreaker, a company that puts on sunrise dance parties all over the world (if you haven’t gone, sign up for the next one - they are EPIC), Radha took to The Hivery stage with our very own Grace Kraaijvanger to discuss her latest creation, her book BELONG: Find Your People, Create Community and Live A More Connected Life. “The first sentence in my book is ‘When I turned thirty, I realized I didn’t belong,’” she told the crowd. Radha’s vulnerability didn’t stop there. She explained in detail how, at 30, she’d found herself surrounded by people who weren’t inspiring, and doing things that didn’t reflect her values. She spent the next several years building a more nourishing community and launched Daybreaker in December 2013, a community that has now extended to more than 25 cities and has upwards of 500,000 members. We are so thankful to Radha for sharing her wisdom and her time. Click here to see more photos from our September Hivery Circle on Facebook.